Summary: Power Girl has been having a tough time. Between destroying half a city block in New York and nearly letting an aeroplane to crash in Metropolis, she's in desperate need of a friend. Specifically a friend who will listen to what she has to say and offer her the comfort she needs. She needs the Huntress! For Helena Bertinelli, it's just another day in Gotham. Some new threat with a gimmick is running loose around the city and she's out to stop him. In her ring is Plasmus, a volcanic-looking man with a German accent who can melt anything with a single touch. Helena Bertinelli proves to be no match for him, but lucky for her, Power Girl came to her rescue. Without any explanation, Power Girl starts telling Helena Bertinelli her woes. She understand why Power Girl came to her specifically, or why she feels she's the "friend" she needs, but she doesn't feel like she's the right person to go to for comfort. Despite the awkward encounter, Helena decides to help Power Girl out, even though she doesn't know how to help her. Just as they're about to formally introduce themselves, Power Girl is seemingly attacked by the Crime Syndicate, then later Superboy, then later the Legion of Superheroes, all claiming to be her "family." The Psycho-Pirate reveals himself and captures Power Girl for Lex Luthor. He doesn't specify why Lex needs her, but Psycho-Pirate reassures her that he is there to "help" her. Review: It is Christmas Eve and the first night of Hanukkah, and what better way to celebrate both holidays than to discuss the third instalment of Geoff Johns and Amanda Conner's heart-wrenching revisitation of Power Girl's origin in the post-Crisis DC Universe? This is my second to favourite issue of the JSA Classified series featuring Power Girl, mainly because it revisits Power Girl's friendship with the classic Earth-2 Huntress, Helena Wayne, and because it presents Helena Bertinelli (the post-Crisis Huntress) as a more sympathetic character than most people make her out to be. It is also one of the saddest chapters in this series. One thing Geoff Johns has been consistent about in his exploration of Power Girl's past is the relationships she once had. The first two issues focused on her past relationship with Superman as her cousin. In this one, Johns is focusing on one of the most important friendships Power Girl had, which was the one she had with the Earth-2 Huntress who was the daughter of her world's Batman and Catwoman. This chapter also shows that Power Girl is either gradually remembering her past or she never forgot it at all and is struggling to make sense of those memories. There is evidence of both. It is explicitly confirmed in this chapter that Psycho-Pirate is behind all of Power Girl's hallucinations and that Lex Luthor is exploiting her for his own goals that will lead to the events of Infinite Crisis (also written by Johns). Despite the villains' involvement, however, Power Girl's feelings are still very much her own, and Johns masterfully shows through his writing just how much Power Girl yearns to reconnect with the people she was once close to. This yearning for rekindling past relationships is at the heart of her interaction with Helena Bertinelli in this chapter. It's very interesting how Johns juxtaposes these two characters, especially given how different Helena Bertinelli is from Helena Wayne in almost every respect except for the Huntress identity and costume. In another lifetime, Power Girl could count on the Huntress to provide her with comfort and emotional support when she was feeling down, and this is what led her to Helena Bertinelli in the first place. Unfortunately for Power Girl, support and comfort is exactly what she doesn't get from Helena Bertinelli because the latter is a complete stranger to her, and because neither woman has had any real reason to bond. Rather, they lacked the right circumstances for developing a meaningful friendship. 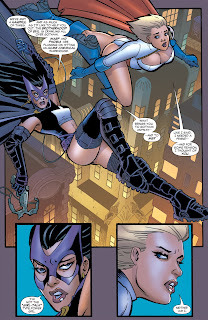 On the pre-Crisis Earth-2, Huntress and Power Girl were the legacies of Batman and Superman. On that world, Batman and Superman were very close friends to the point where they considered each other family. This familial relationship also facilitated the natural meeting between Batman's daughter and Superman's newly arrived Kryptonian cousin. It was almost destiny that these two women would become the second generation World's Finest as well as very close friends themselves. They were part of a larger family legacy. While Helena Bertinelli is still technically a member of the Batman family, she's also the black sheep of that family, and the "child" Bruce has the most complicated relationship with--a problem Helena Wayne never had with her own father or even the Earth-1 version of him. Helena Bertinelli very much feels like an outsider and doesn't believe anyone truly likes her, which makes her comment about super-powered heroes lacking self-confidence ironic because she's lacking in that as well. It's literally the reason she struggles to make friends and why she tends to be sceptical of others who want to be her friend. That "outsider" status is ironically the thing she has in common with Power Girl and something Johns brings to the forefront in this chapter. Despite the fact that Helena Bertinelli lacks the appropriate history to be the friend Power Girl needs, Johns also shows that Helena Bertinelli is not made of ice and still cares about other people. Though she doesn't understand why Power Girl would come to her specifically, or why Power Girl considers her her "friend," she does recognise that Power Girl needs help and offers it anyway. She doesn't know how to help her or what Power Girl actually needs from her, but she does want to help her all the same. She's also the first to confirm that Power Girl is not off her rock and that there is a real entity trying to drive her mad. She just can't see the threat because Psycho-Pirate is targeting Power Girl exclusively. On the whole, this continues to be a strong third instalment from Geoff Johns. He strikes a good balance between plot and character, effectively creating an emotionally engaging narrative about one of Earth-2's most compelling heroines. He is of course able to accomplish this with the skilful hand of Amanda Conner, who once again, sells the emotional punch through her artwork. She has a very strong handle on both Huntress and Power Girl's characters in this story, but it is her Power Girl in particular that you tend to connect with the most. Everything from the way she captures Power Girl's vulnerability and tough exterior to the way she captures Power Girl's body language and attitude. Her Power Girl is very dynamic with no one trait ever dominating the character. Next week, we reach the epic conclusion of Power Girl's journey with JSA Classified #4 and the start of Power Girl's 41st Anniversary! (Yes, 41st because she actually made her debut on 31 December 1975).